Shah Rukh Can: The Life and Times of Shah Rukh Khan is the biography of the phenomenal Indian actor written by Mushtaq Sheikh, a close associate of his. It is mostly about the highs and lows that the Bollywood actor has gone through in his career as an actor. Shah Rukh Can: The Life and Times of Shah Rukh Khan is a personal account that looks into the different dimensions of the actor’s personality, the man behind the star. It talks about what factors constantly persuade him that pave the way for his prodigious triumph. The book has several interviews with directors and others from the film fraternity who candidly express their experiences with the star that SRK is. The biography also brings out SRK’s own visions about acting versus performance, and features of making a movie. The trying times when he and his elegant wife Gauri had to work hard just to pay for their monthly rent and other such struggles he went through in his journey bring a poignant touch to the read. Mushtaq paints vivid pictures while narrating Shah Rukh Khan’s early career and his ascent as an incredible star that he is today. 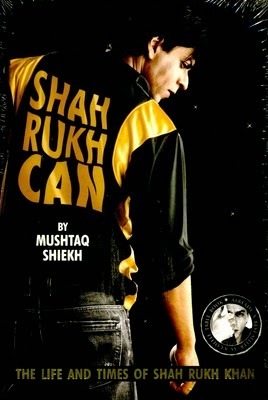 The book contains fascinating trivia about SRK. Mushtaq shares bits and pieces of events and occurrences from the actor’s life - his awe for Amitabh Bachchan, his appearance in a TV show as a hasty driver, the invaluable support given to him by Vivek Vaswani in the beginning of his career, and also his lack of empathy the idea of playing Devdas when he heard the story from Sanjay Leela Bhansali, his friendship with Karan Johar, and how his delay to act in Farah Khan’s Main Hoon Na led her to frustration. An interesting read that the biography offers, the book also provides some perceptive and intimate details about King Khan. Mushtaq Sheik is an actor, a script-writer and a notable Page 3 personality. He is one of Shah Rukh Khan’s close friends. He has also performed alongside Shah Rukh Khan in movies such as Om Shanti Om and Ra One. He was previously associated with G magazine as a reporter. He later became the Editor for Star and Style, and got himself involved in working as the Creative Director at Indiainfo.com. Mushtaq has penned widely read columns on fashion for Sunday Midday and Gladrags. He currently lives in Mumbai.